The ALA Junior Leader Training Program is a year-round program that gives leaders in-depth training in leadership skills including character traits, problem solving, communication teambuilding, and service. Junior Leaders meet every six weeks with well-trained volunteer facilitators to learn leadership skills and apply them while doing service in the community. The program is designed to promote leadership, character, and problem solving so that youth can become examples of excellence in all that they do. The Junior Leaders engage in ongoing learning as they complete Leadership Pins. Each Leadership Pin challenges them to apply their leadership to their interests, explore new topics, and to solve problems in their lives and in their community. Youth lead by example in all they do as they build self-confidence, create lifelong friendships, learn to make positive decisions, and become responsible and caring citizens. 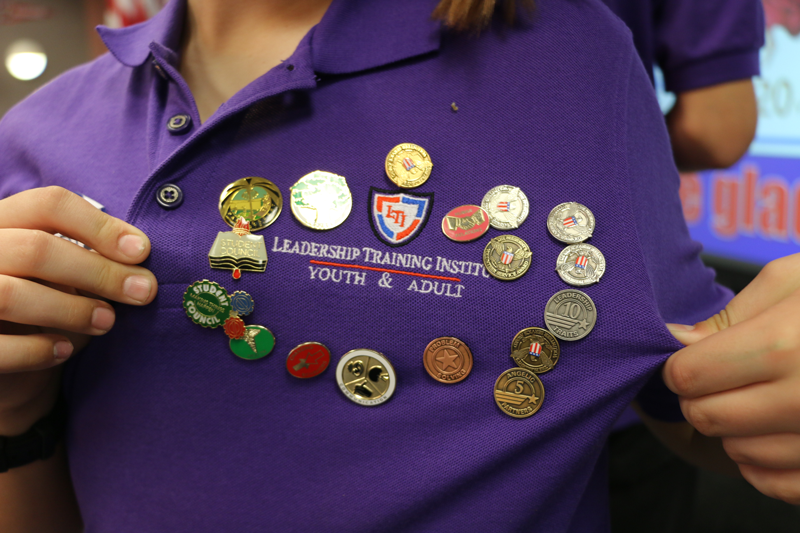 This Leadership Pin helps youth learn to demonstrate leadership, sportsmanship, and good communication while they develop physical fitness and healthy habits. They are encouraged to make positive use of their leisure time and to develop healthy relationships on and off the field. Junior Leaders are encouraged to show excellence in school by maintaining good grades, graduating high school on time, and showing character at school. Junior Leaders are required to maintain a minimum 3.0 GPA and must seek the help of tutors if their grades drop below this mark. Academic Excellence is promoted with a Leadership Pin, honoring those who maintain straight A’s or a 4.0+ GPA. Junior Leaders foster their creativity, improve their talents, and build their confidence as they complete this Leadership Pin in the outlet of their choice: Fine Arts, Dramatic Arts, Photography, Cinematic Arts/Film, or Music. This Leadership Pin helps youth develop healthy habits and positive behavior, set goals, and understand the consequences of unhealthy choices. It promotes responsible decision making as they grow into self-sufficient adults. The Career Exploration Leadership Pin encourages Junior Leaders to take a look at various career options, learn important job skills, and develop action plans to move into the careers and jobs they choose. The ALA Junior Leader program is a year-round program that gives leaders in-depth training in leadership skills including character traits, problem solving, communication teambuilding, and service. Junior Leaders meet every six weeks with well-trained volunteer facilitators to learn leadership skills and apply them while doing service in the community. Junior Leaders are required to attend each meeting, participate in service activities, and show leadership at home, at school, and in their communities.